My mother made the decision recently to switch from a regular smartphone contract to a prepaid contract. It simply did not make sense for her to pay €30 per month for making a couple of calls, sending some SMS and using WhatsApp. Along with the change came a new phone number. While it was easy enough to inform all her contacts about the new number, it took me a while before I discovered how to move all WhatsApp data to a new phone number. There is one important reason why you need to inform WhatsApp about the move. If you don't, and someone else gets that number (as it gets back in the pool some time after the contract expires), data Whatsapp collected becomes available if the software is installed on the other person's device. Since you don't want that, as it is a privacy-issue and can lead to social engineering attacks, you'd better make sure that this does not happen. And that is done by notifying WhatsApp about the change. It is relatively easy to change the phone number provided that you know that it is possible and where to find the setting. Open the WhatsApp application on the device using the old phone number. Tap on the three dots in the upper right corner (menu). When the settings menu opens, select Account from the items listed on the page. Select change number on the next page. WhatsApp displays information about the process on the next screen. Basically, changing the phone number migrates account information, groups and settings to the new number. It is important that you can receive SMS or calls (for verification) on the new number. Enter the old phone number in the first field on the next page and the new one on the second field. Select done afterwards. You need to verify the new number. How you do that depends on whether you have two phones or only one. If you have two phones, you should have received a verification SMS and use that to authorize the migration. If you have just one phone, you need to switch SIM cards during the process instead. As soon as you verify the new number, the old gets deleted and is no longer usable. Someone else who registers it at a later point in time starts with a blank account. All that is left to do now is to inform your contacts about the new number. This can be done directly in WhatsApp and should not be a big issue. 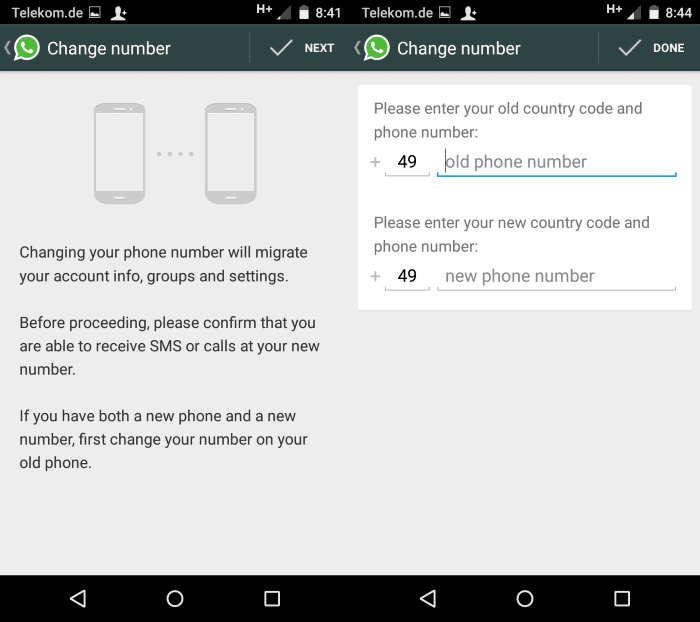 Find out how and why you change your number in the popular messaging application WhatsApp. Great article as always! :) So just wondering so it is not possible to keep the phone number when changing the device in Germany, even if you use the same carrier? Thanks. It is possible under certain circumstances, but not in this case unfortunately. That’s good to know. Thanks for that one, Martin! Anyone know how to use WhatsApp without a mobile number? I have an iPhone with no SIM card (by design), but want to use WhatsApp via my wireless. Whatsapp is tied to your phone number – this is your identificator to send and recieve messages. You can use Whatsapp on a device without SIM (like your iPhone) BUT you need a second phone with a phone number just to register your account on iPhone. So you install Whatsapp on your iPhone and enter the phone number of your second device. Confirmation SMS with the code will arrive on that device and you have to enter that code on your iPhone. And that’s it – you will be registered and you can send and recieve messages from your iPhone by identifying as that number. how to get old whatsapp backup of symbian into lumia phone ? Pls research and let me know if it is possible or not ? 4. Now i want to change my Chinese Number with Indian Number, With all the older groups and contacts just like India. Please help me :( .